It is only very occasionally I get to see an A3+ printer. This prints quickly even at that large size. However the overall size of the unit is not as big as some other A3+ models. Certainly you will need a good amount of desk space for the Stylus Photo A3+ printer from Epson, the dimensions are 60x30x20cm when closed, you will probably need to add another 30cm to the middle depth figure to have paper inserted in the 'stand up' rear and the paper output tray at the front extended. Maybe another 18cm to the 20cm height for the paper waiting to be printed. Yes it can print text pages and look further down for some timings but surely you do not buy a six ink printer to print text pages? The inks are two cyan, two magenta, one yellow and one black. The printer has standard power and USB connectors on the rear with just three buttons on the front right edge. The only other connector is a 'Pict Bridge' socket on the front. But this printer is designed solely to print and even if you use the 'Pict Bridge' connection all your choices will need to be made on the camera. I was amazed at the speed of printing A3+ pages at only 320seconds for either a borderless print or any other combination you may choose to print on a single sheet of photo paper. If you are unsure of the size of an A3+ sheet it is 48.5x33.5cm against an A4 sheet that is around 21x29.7cm. Even an A3 sheet is 42x29.7cm IE it's twice the size of A4. Printing A4 sheets again borderless with either a single image or four near 15x10cm images took around 180seconds still quite quick but as always my main concern with photo printing is quality and not speed and the quality here is excellent. Okay - although it seems very strange - the promised A4 text page timings. As always I use two main test documents the first a 200 word document printed in 'draft' mode, this printed at 12PPM and rather than the normal grey shade it has a tinge of red/brown but certainly not nice crisp sharp black. Printing the more normal 1500 word document spread over four pages came in at around 10.5PPM. There are five print modes from the preferences tab 'draft', 'text', 'text & images', 'photo' and 'best photo'. However Epson provide a range of software with the unit and this includes the excellent Epson Easy Photo Print that works with all sizes and styles of photo papers and you simply need to select the images you want to print, state the type of paper you will print them on and finally select the layout of the page and then just press print and leave the rest to the software. This also allows you to select just part of an image or enlarge/reduce the image size. Even if you are printing multiple images on a page you can make the adjustment apply to just one image as each image is highlighted separately. Should you have the need to print large images such as A3 or even A3+ then this printer can do so and it does not take a huge amount of room to do it considering the size of the paper it takes into itself. 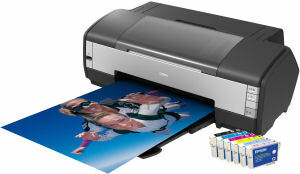 Doing my Internet searches found the Epson Stylus Photo 1400 at a best price of £243.59 from the first link below. This is never going to be a mass seller so the discount on the stated price of £299 is not going to be huge. Given the units size free delivery is certainly something to have.